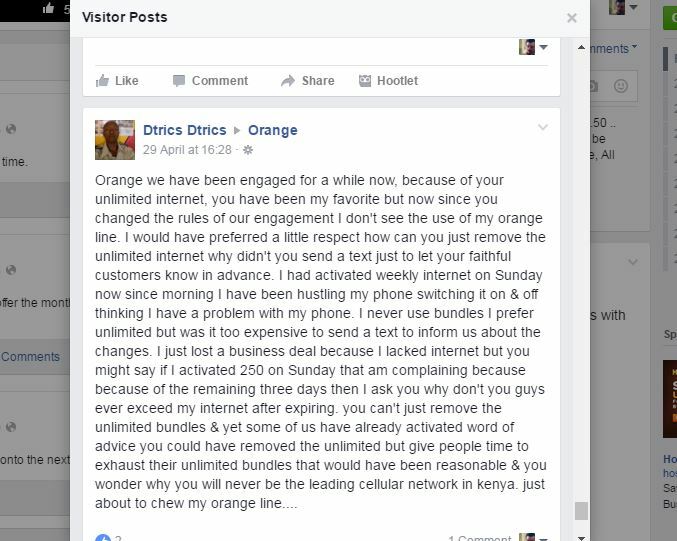 It has been a rough 2 or so weeks for thousands of Kenyans as Orange Kenya quietly shut down its unlimited internet plan. The struggling mobile operator has been the cheapest provider of un-metered internet in the country, but it seems that was not working for them. 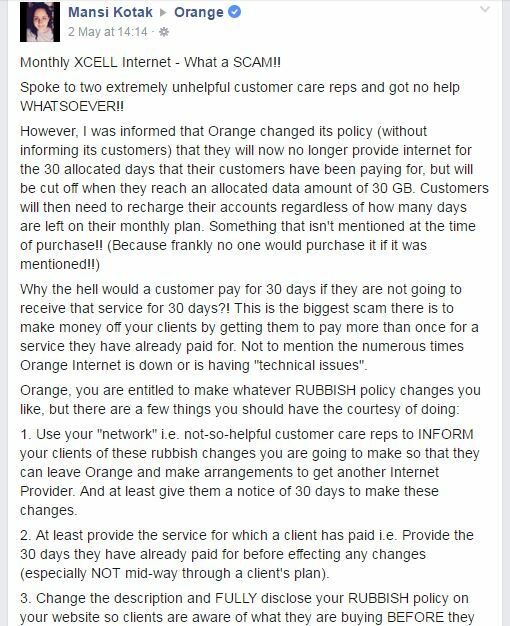 Orange just recently changed the name of their unlimited plans to XCELL, but that did not come with immediate change of the terms and conditions… until a few days ago. The internet plans are still divided into modem and mobile. The mobile plans are as follows. As you can see from the table above, a new ‘CAP’ column has been introduced. Previously, in the daily unlimited for instance, once a user reached the 200 MB Fair Usage limit, the speed would be capped at 128 kbps for the reminder of the 24 hour period. The same applied for the weekly and monthly, in that once a user exhausted his allocated 3 GB before the 30 day period was over, he/she would still access the internet for the reminder of the duration at reduced speeds. 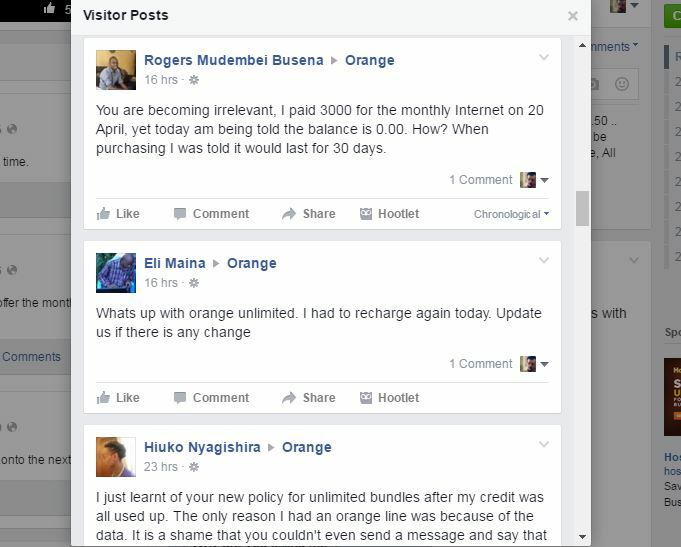 Now, Orange has scrapped that and have basically converted it to a bundle plan no different from what Safaricom offers. The daily mobile plan for instance gives you 400 MB (200 MB at normal speeds and 200 MB at reduced speeds). After exhausting that, you will need to buy a new plan. And the same applies to the modem XCELL plan. 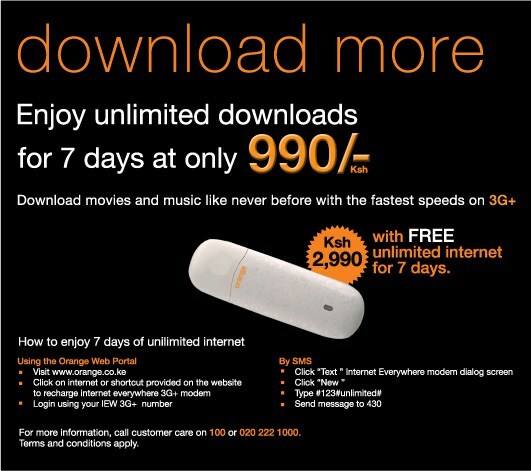 The Sh990 that initially gave you virtually unlimited internet for 7 days now comes with only 15 GB (10 GB at normal speeds, 5 GB at reduced speeds). The Sh2990 monthly plan now has a limit of 30 GB (20 GB at normal speeds, 10 GB at reduced speeds). If you exhaust this within say, 5 days of your 30, you’ll need to buy another plan. 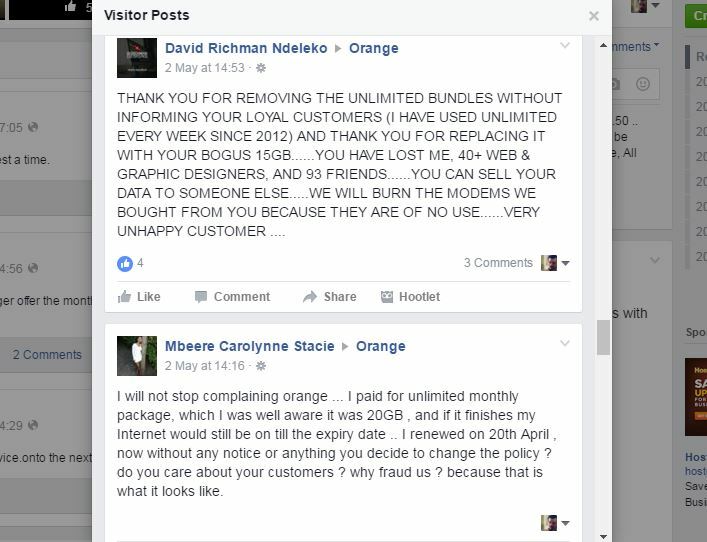 Without clear communication from Orange, many subscribers have been left to guess why their devices are no longer connecting to the internet. Some were in the middle of their weekly or monthly plans when the changes were effected. 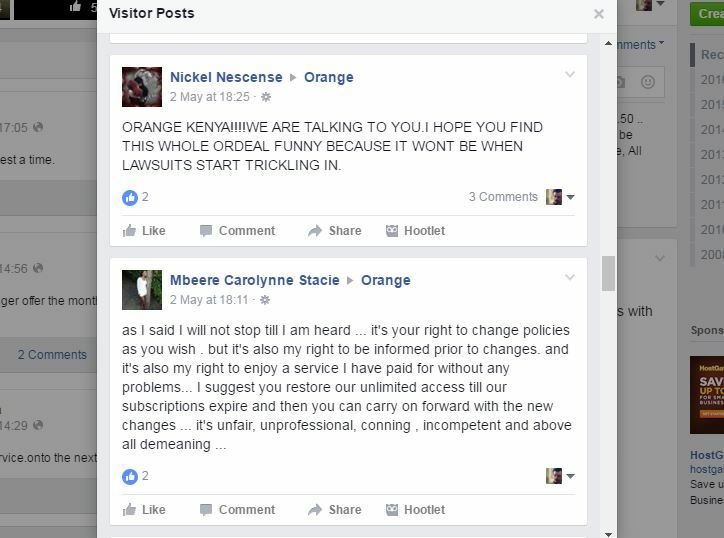 Here are some comments from Facebook. 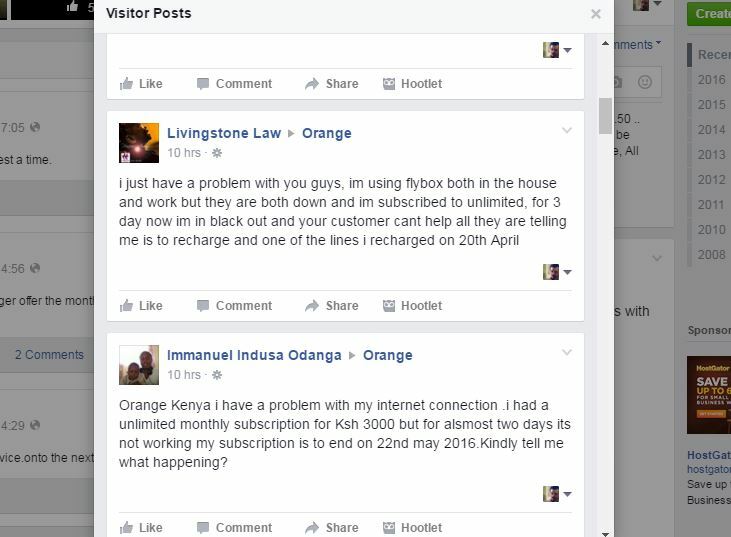 Safaricom has not shown any interest in bringing back their unlimited plans. Airtel on the other hand has some really pocket friendly unlimited internet plans, but you’ll be lucky to find a decent 3G connection anywhere. 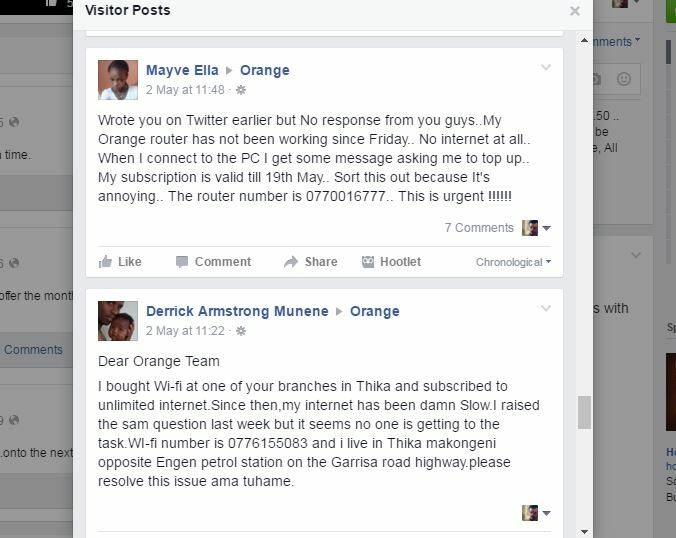 Orange’s future in the country is in doubt, with constant news of foreign acquisition or market exit. It is thought that most of their clientele, especially young people, were in it for the unlimited internet. Whether they will stick remains to be seen.